The recently released minutes of the last FOMC meeting made some economists and market participants begin contemplating the Fed's exit, its timing, and the implications. This is because the FOMC's discussion sounded a bit more hawkish than many had anticipated. FOMC Minutes: - ... many participants also expressed some concerns about potential costs and risks arising from further asset purchases. Several participants discussed the possible complications that additional purchases could cause for the eventual withdrawal of policy accommodation, a few mentioned the prospect of inflationary risks, and some noted that further asset purchases could foster market behavior that could undermine financial stability. But what will an exit from such extraordinary expansionary policy actually look like? Much of course will depend on the trajectory of the US economy in the next couple of years, but there are two key possibilities. One is that the Fed will simply end purchases and let the securities naturally pay down (due to prepayments on MBS) and mature. 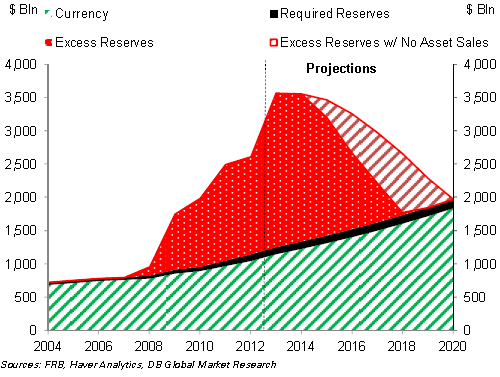 However, given the rate at which excess reserves are now being created through asset purchases, it may take too long to "drain" these balances (excess reserves represent the largest component of the monetary base now). According to DB, without any securities sales it will take until 2020 before bank reserves return to normal - after the latest round of purchases as well as purchases yet to come. If inflationary pressures pick up, the pace of a "passive" exit may end up being insufficient. The alternative would be to begin selling securities in order to accelerate the draining of the reserves. The chart below compares the two potential scenarios. But there is a cost to this "active" exit strategy. Long before the Fed officially telegraphs that it will begin selling, the markets will push long-term rates higher. MBS durations will extend as prepayments slow, and MBS spreads will likely widen. The market will begin effectively "front-running" the Fed. Moreover, MBS holders and mortgage servicers will begin to actively hedge their portfolios (something many are not doing now due to high prepayment activity) by shorting long-dated treasuries and steepening the yield curve more. By the time the Fed actually begins selling, its massive securities holdings will likely be "under water" and many sales will result in realized losses (note that the Fed generally isn't concerned about unrealized losses that would be generated during a "passive" exit). In recent years the net interest income generated by the Fed (less operating expenses) hit a record due to all the coupon payments in the Fed's portfolio. This income has been remitted to the US treasury on an annual basis. But as losses from sales accumulate, the "dividend" which the Fed has been paying in the past, will dwindle and possibly turn into a loss. The amount of loss will depend on interest rates as well as on the timing of the exit. According to DB, if sales begin this summer - an unlikely scenario - the net losses could largely be avoided. 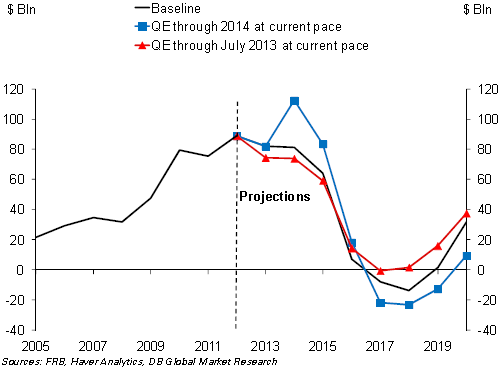 The blue line above dips further down of course if long-term rates move higher than projected. Some FOMC members are in fact becoming concerned about this outcome. Furthermore, if the Fed raises the overnight (Fed Funds) rate, it will also have to increase the rate it pays on excess reserves (the two will likely be adjusted in tandem), increasing the cost of liabilities and exacerbating losses. The "active" exit strategy therefore looks quite messy. In practice however the Fed should be able to absorb such a loss. It would in effect "borrow" from itself to cover the loss until it generates enough income to extinguish this P&L item. This is "accounting magic" that only a central bank can implement. DB: - Possibly in anticipation of [losses], the Fed adopted new accounting principles in January 2011, which specify that realizations of negative net income are capitalized as an asset on their balance sheet. This “asset” would be counterbalanced by the creation of additional reserves of value equal to the asset. 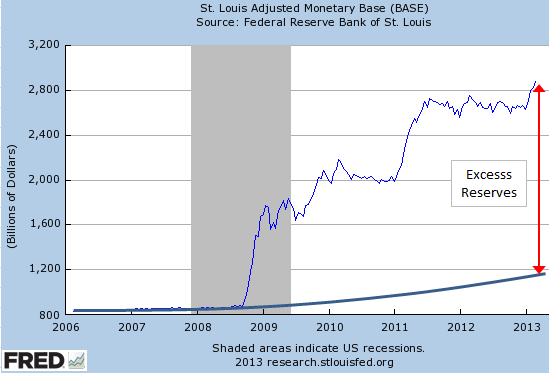 That is, the Fed would in essence create new money to cover its losses. The increase in reserves created to deal with the Fed’s income losses will only partly offset the reduction in excess reserves associated with the asset sales that generated the losses in the first place.... Over time, the deferred asset would accumulate if the Fed continued to experience negative net income and be reduced when net income turned positive. Once the deferred asset was reduced to zero again, the Fed would resume remittance of its positive net income to the Treasury. Other than the loss of revenue for the US Treasury, the problem for the Fed will be mostly reputational, as it carries these losses on its balance sheet - potentially for years. But given the public's perception of the Fed these days, such a loss is something the FOMC will likely take quite seriously.